Maria is named after the Virgin Mary: as a child she was discovered under a statue of her namesake in an abandoned church. She was then adopted into the ultra-rich Sanzen'in family. She entered the prestigeous Hakuou Academy for the Rich at age 10 and graduated at age 13 in an education process most people only finish at the age of 18. Now only 17 years old, though frequently mistaken to be much older, she works as the sole maid of the Sanzen'in estate. As the down-to-earth Tsukkomi, she usually knows both sides of the frequent misunderstandings between Nagi Sanzen'in and her butler Hayate Ayasaki (female and male leads, respectively). Nagi's SP (personal special bodyguards/grunts) obey Maria over their boss, as too does Nagi's 300kg pet tiger. She is highly intelligent and competent, yet she has signs of a sheltered upbringing (i.e. naivete towards the outside world). This leads to delicious scenes such as when she gets fascinatingly enthusiastic and childishly excited at her first time in a Karaoke room (enough to forget her 'duty' of watching over Nagi who was in the next room). Maria is a loyal maid and motherly figure to Nagi, but she is also a woman. 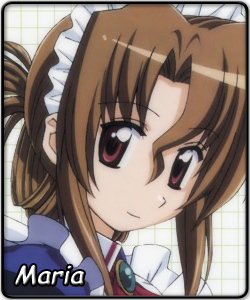 On a few occasions, it has been hinted that Maria has a love interest in Hayate, signified by her occasional blushes. She has been on a date with him once (for research to aid Nagi's latest manga) where she enjoyed herself like an ordinary high school girl (clothes shopping, ferris wheel, etc). When Nagi's manga story is animated using Maria and Hayate as main character designs, it forces the two to think about their relationship. Asked how she would continue the story, Maria came up with this: "If you're a man, go for all the heroines at once!!" Obviously Hayate couldn't do this, to which Maria impishly laid a finger on his heart and replied "then make your choice carefully." Maria's job is usually to watch over Nagi, but that doesn't mean she can't have fun on her own. Her entry in Saimoé Japan 2007, however, had been partially stained by a first round matchup with Kagami Hiiragi (Lucky Star), to which she lost by 195 votes. She did, however, have the luxury of watching Nagi enjoy herself all the way to a second place finish. However, in Korea Best Moe, Maria did exponetially better. She swept through the preliminaries and the rounds of 64 and 32, defeating San Seto (Seto no Hanayome), Kaede Fuyou (Shuffle! ), and Shiori Misaka (Kanon) along the way. However, in the round of 16, she faced a road block: Shana (Shakugan no Shana), who happened to be the hottest competitor in the Saimoé circuit at the time, and after one of the closest and exciting matches in Saimoé history, Maria lost by only 17 votes, finishing an eventual 11th. Once again, she ended up watching Nagi once again, who ironically lost to Kagami in the round of 8. After receiving an invitation to Korea Super Best Moe, Nagi and Hayate did something nice for Maria - order a Suigintou (Rozen Maiden) cosplay outfit to help Maria garner votes. During the special invitational tournament, Maria did fairly well - in a severely difficult preliminary round, despite losing to Haruhi by a sufficient margin, Maria was able to move on by edging Nanoha Takamachi (Nanoha) by 9 votes, not to mention defeating Kagami in a rematch at the same time. In the round of 16, she defeated Mikuru by 98 votes to move on to the round of eight, where she did almost the unexplainable - take down Suiseiseki (Rozen Maiden), Saimoé's only two-time champion to date and Shana's greatest rival, by 71 votes. With Nagi as well as Nagi's classmate and 2007 Korea Best Moe champion Hinagiku Katsura (Hayate no Gotoku) taken down in the same round, it seems that Maria would be able to carry the banner for the Sanzen'in estate. Then she met Shana, who ironically defeated... no, humiliated the real Suigintou by over 600, again in the semi-finals and lost by over 200. Shana would eventually move on to win the Korea Super Best Moé championship. Then the Suigintou outfit came - three days too late. Maria is expected to return to the Saimoé circuit once again this year to take care of Nagi, but also to find her own Saimoé tiara. With a few more years of attempts to make and years of experience that exceed her age, Maria is expected to do well here in the International Saimoe League, but is this the year she wins an International Saimoé Tiara?